Innovative activities are given a boost with the creation of the system to manage machine productivity and a special unit for machining turbine blades. Juaristi, the Gipuzkoa-based company, continues to lead in the field of large scale machine-tool design thanks to intense R+D+i work that has culminated in the launch of two new models of boring and milling units, supervisory software for machine management and a special solution for turbine blades. Juaristi's work in the construction of large scale machine tools shall be further boosted in 2015 with sales of the new TX7 y MX9 RAM high-productivity models, which have been acquired by companies in Germany, Italy, India and Brazil. According to company managers, renewal of the product catalogue with more versatile, precise and powerful equipment shall contribute towards better positioning in the made to measure, large-scale machine tool manufacturing market. This market segment has shown signs of growth in recent months in internal and European markets, as well as in India and China, where movements in the sector have been stagnant since 2013. Sales of the TX7, a boring and milling centre that can work with hub parts of up to 6x4x3 metres, took off with the supply of the first unit to the German manufacturer, Zaigler, specialists in machining large diesel engine blocks for companies such as Man or Caterpillar. Juaristi has stated that market reception to the solution has been very positive and has been further consolidated with another order from the Italian manufacturer, Bianchi, as part of the large-scale part subcontracting sector, as well as a healthy rhythm in demand for offers in this model over the last few months. The TX7, according to these sources, can perform complex machining of parts of up to 40 tons thanks to its boring quill and automatic headstocks, whose loading system enables boring to milling change operations of between 1 and 2 minutes. Another outstanding option is the inclusion of a multi-angular headstock of 0.001° x .001° that can work in any spatial position. Yet another impressive feature of the unit is the improved vertical course of the central headstock, which has been provided with double ball screws and two motors to give greater precision and superior dynamics. The TX7 has awakened great interest in the moulding sector by combining a powerful roughing capacity in the boring quill and high speed and fine finishes with the five-axis headstocks. The latest inclusion to the Juaristi catalogue is the MX RAM floor type milling machine, which has the major new feature of a vertical course of up to 6000 mm and a RAM course of 1900 mm with a central headstock and bore design of 180 mm diameter with a double RAM drop compensation system. Juaristi shall deliver the first units midyear (May and August) to clients in India and Brazil. The Indian firm, Jindal Steel Works shall use it to machine large scale parts for capital goods; while the Brazilian state company, Odebrecht, plans to implement it for its activities in the shipbuilding sector. The machine includes an automatic headstock of 0.001° x 0.00° that enables it to be auto-calibrated along with a mobile storage system for automatic changes, sensors for parts measurement and tool calibration, and a rotary table of 5000 x 6000 mm with a capacity of up to 100 tons. The innovative work of the Juaristi R+D+i team can also be seen in other creations that amplify the range of services and added value to clients. With support from the Gaitek Program of the Basque Government, supervisory software has been developed and implemented to automatically manage machine productivity. The system monitors management of tools, pallets, working hours, programming of parts to be machined, etc., so as to optimise all the planning and use of workshop resources. It has also created a special solution in collaboration with a client in the Basque Country based on its MX5 machine for machining specific, highly complex products such as turbine blades. Finally, the management of Juaristi, have pointed out that the new range of machines has been technologically enriched thanks to its participation for three years in the Cenit Impeler, supported by the Centre for Industrial Technological Development (CDTI). 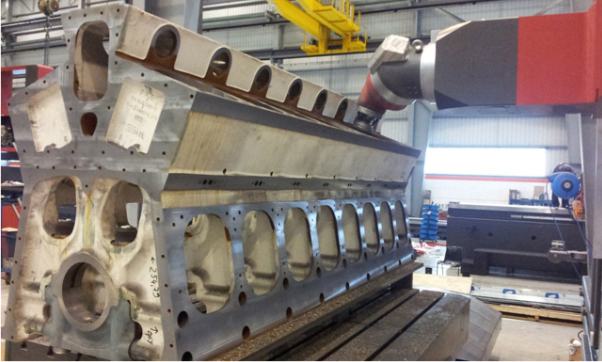 This R&D program focused on improving volumetric compensation of large machines. This knowledge has made it possible to increase machinery precision, improve speeds, run dimensions, weight capacity on the table and, thanks to the new designs, fine tune thermal and mechanical behaviours of the machine.